This documentary is required viewing for anyone interested in understanding the reality of everyday life, both good and bad, in contemporary Democratic Republic of Congo, Zambia and South Africa. Africa has been the source of much mystery for generations. Few people outside the continent really understand how life is for its inhabitants. 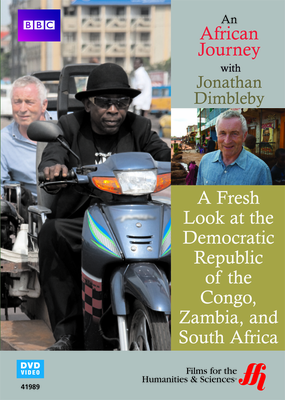 In this DVD, host Jonathan Dimbleby visits three countries in the southern half of Africa to provide viewers with firsthand accounts of how things are for average people. The video serves as a counter to the overall negative portrayals of the region on the nightly news. All is not well in Africa, and Dimbleby does not hold any punches. He begins with a visit to the Democratic Republic of the Congo where polio is a persistent problem. There, the host spends time with members of a musical group, who despite being stricken with the disease, use their illness as the source of inspirational song. It is this type of honest appraisal of the harsh reality of life in Africa, mixed with the positive outlook of the people, that is the theme of the documentary. Much of this optimism rests on China’s stated commitment to help rebuild the infrastructure in the region, Dimbleby finds out. Overall, the documentary offers a different perspective of life in Africa than most viewers have ever known.